Perhaps Gora Brewery & Grill should be renamed Gora Grill & Brewery because I’m sure the grilled food is miles better than the beer produced. The setting for Gora Brewery & Grill is second to none – beautiful views over the valley, Japanese zen garden, a foot bath for you to rest your weary feet. But the beer is simply not worth the trek out for at all – and that’s the biggest letdown about a place that has practically free reign over the area. I would love to be positive about the beer but the only positive thing I could say about it is that at least there is a brewery in the area. The whole place is non-smoking and also offers up free wifi but it’s most definitely not family friendly and there is a table charge of 5% at dinner times. There was also some English on the menu for those worried about that. Breweries high up in the hills in Japan are few and far between. At an elevation of almost 600m, Gora Brewery & Grill is one the highest in Japan, with Tamamura Honten and Minamishinshu Beer being two others that are higher up. Gora Brewery & Grill opened up in July 2017 and is a collaboration between Nobu, the famed Japanese eatery, and the local village to produce craft beer that can be paired up with the food. All of the beers and food are produced on site using as much local produce where possible. The head brewer got his experience by working at Rise & Win Brewing, aka Kamikatz, down in Shikoku. Gora Brewery & Grill is located about a 10-minute walk from Gora station, on the Hakonetozan line, though it is an uphill walk so bring some drinks just in case you go in the summer. The whole building has been designed to be as friendly as possible. The building is reminiscent of the Rise & Win Building too, with lots of glass and a red facade. Outside, there is a small foot bath for you to relax at after all the walking around the village. There is space for about 50 people inside, with tables dotted around, though the bar counter seats take a close second place to the foot bath. Let’s be honest, drinking beer as your feet are relaxed is one of life’s greatest pleasures. Gora Brewery & Grill is completely non-smoking, though there is a table charge of 5% at dinner times. The beers at Gora Brewery & Grill are the only ones on tap, with a choice of four beers available. The beers come in two sizes of small (250ml) for ¥600 or medium (400ml) for ¥800. There are also small takeaway beers for ¥700, though none of the prices include tax. 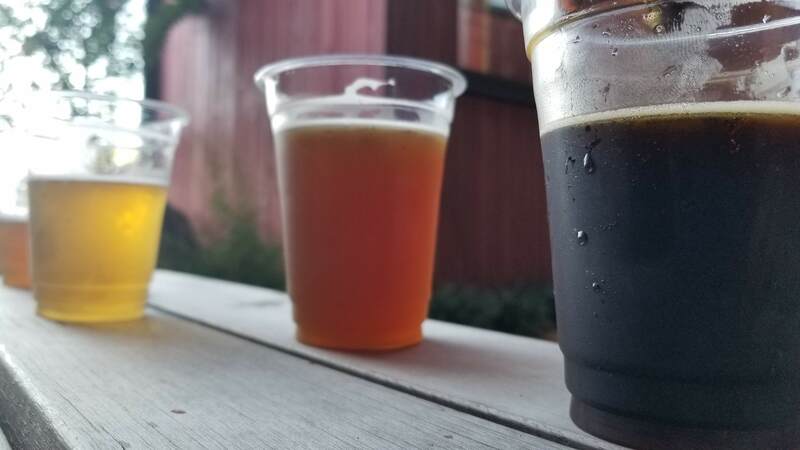 Considering the remoteness of the brewery, I expected the beers to be more expensive than they are; however, the beers were really not representations of the styles listed. So much so that the two other people I was with couldn’t finish their beers due to the strange flavours going on, with the white beer being of particular note for being bad. I’m hoping that they begin to improve as there is nothing else in close vicinity for craft beer. There is also a happy hour on weekdays from 13:00 – 16:00 which gets you a 330ml beer for ¥500 or a growler (1800ml) for ¥2,600. I didn’t get to try the food as the prices put me off – if you’re going to put the name Nobu to something then customers should expect to know about the prices beforehand. For which Gora Brewery & Grill do to their testament but again, with not much else in the area, the prices are going to be higher than usual. The menus were in English as well as Japanese, so tourists to the area will not find it hard to get something to eat. Moreover, there were plenty of vegetarian options as well. The closest station is Gora station on the Hakonetozan line. Gora Brewery & Grill is about a ten minute walk from the station.